This nifty workaround is a copy and paste font generator that converts regular text to free cool fonts including 𝐛𝐨𝐥𝐝, 𝘪𝘵𝘢𝘭𝘪𝘤, ʄǟռƈʏ and 🅜🅞🅡🅔 that can be used on Twitter, Facebook, Instagram, Snapchat, blog posts and yes, gσσgℓє ¢ℓαѕѕяσσм. How does it work? Access the ᑕOOᒪ ᖴᗩᑎᑕY TE᙭T GEᑎEᖇᗩTOᖇ, select a font, click the 🅳🅴🅲🅾🆁🅰🆃🅴 button and customize your text. Once you dig the output, click the 🅲🅾🅿🆈 button and then 🅿🅰🆂🆃🅴 your $цpёя cѳѳг text wherever you need some good stuff. In addition to sᴛʏʟɪsʜ fonts, the ᑕOOᒪ ᖴᗩᑎᑕY TE᙭T GEᑎEᖇᗩTOᖇ also offers some pretty neat ★·.·´¯`·.·★ tєхt dєcσrαtíσns ★·.·´¯`·.·★ and symbols that can be added to the mix as well. So, the next time you want to impress your students, colleagues and/or friends, dial up the ᑕOOᒪ ᖴᗩᑎᑕY TE᙭T GEᑎEᖇᗩTOᖇ—or if you’d prefer the mobile version, check out the Fancy Text iOS app or the Fancy Text Android app. Grab your students’ attention with information that ✤ ѕтαɴdѕ αpαrт ✤ from the rest by using the ᑕOOᒪ ᖴᗩᑎᑕY TE᙭T GEᑎEᖇᗩTOᖇ. Russin showcasing new signage in our Media Center. But that doesn’t mean I’ve been completely absent on the edtech scene. In fact, quite the contrary. The last five months have been super busy with all kinds of new adventures that have been unfolding in my journey as an educator. From finishing a three-year media center project to opening a third high-tech makerspace to supervising a student-run escape room business to developing a new concept known as Xscape EDU, one that is geared toward promoting breakout activities in the classroom, I’ve been on the move. And that’s not to mention all of the conferences, trainings and workshops I’ve been attending or the classes I’ve been facilitating at Penn State Altoona. Plus, our district has partnered with Modern Teacher in an effort to shift our traditional classrooms toward modern learning environments across the K-12 spectrum—a very in depth, time-consuming but extremely worthwhile process. All good stuff, for sure, and nothing I would change… But I must admit that I really miss writing on this blog. My goal is to get back to one of the things that makes me happy so hopefully I will be able to carve out some time in this crazy schedule to do so! 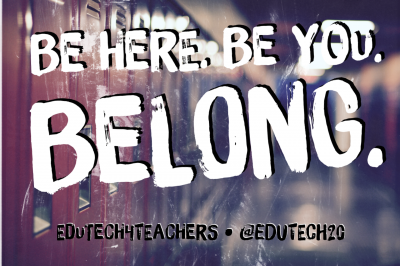 In the meantime, be sure to follow Edutech for Teachers on Twitter and Facebook, two spaces where I regularly share valuable edtech resources and information. Looking for some fun activities to celebrate Halloween in your classroom? Then look no further! Listed below is a recently updated version of some really spook-tacular educational Halloween resources that are sure to creep out your students—in a good way, of course! Also generated by Eric Curts, this fun, and educational Google Slides activity is a great way for students to be creative and to work on writing skills by describing the Jack-O-Lantern they build with shapes and/or drawings of their own. Check out three challenging yet fun hands-on games with a Halloween twist located on the Breakout EDU site. In this project tutorial, learn how to make six different Halloween paper circuit creations. Using parallel and simple circuits, students can bring these templates to life with copper tape, LEDs and batteries. A collection of 100 Halloween STEM activities that are completely free via Nick’s Picks for Educational Technology. The STEAM Powered Family gathered 31+ science, tech, engineering and math activities that capture a child’s interest and imagination during this spooky season. And so many of them are perfect for our young scientists! Be sure to check out this spectacular STEM adventure projects! Another collection of Halloween goodies from Nick’s Picks for Educational Technology. Get your classroom in the Halloween spirit with these math and science activities, writing ideas and crafts. This site, powered by Scholastic, includes Halloween-themed book lists to find a perfect read-aloud title or scary stories to share with your students for independent reading. 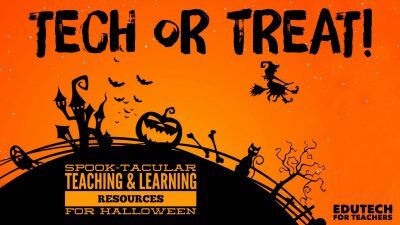 To prepare for Halloween in your classroom, check out these Halloween classroom activities from Teach HUB for new ways to sneak in some spooky lessons and ghoulish learning! Math… Pick a Pumkin… Bats in the Classroom… And Historical Figure Day, an alternative to the traditional Halloween hoopla. If you’re ready to celebrate Halloween in “spooktacular” fashion, you’re sure to find a fun idea or two right here on the Education World site. A collection of nearly three dozen hands-on activities (with accompanying pictures) from the Proud to Be Primary blog. A Pinterest board containing 90+ Halloween sites to celebrate Halloween by Edutopia. A collection of all things Halloween by Larry Ferlazzo—A visual history, slideshows, vocabulary and spelling games, cloze activities, Halloween Around the World and Mia Cadaver’s Tombstone Timeout, one of the most favorite games found on the BBC site and more! A variety of educational sites for Halloween by 19 Pencils. 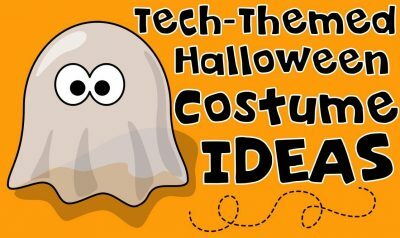 Check out and/or share some pretty neat tech-inspired Halloween costume ideas on the Tech with Us Community Facebook thread found here. A shout out to Julie Goode Smith for generating this fun post! Use these resources to teach and learn about Halloween in fun and hands-on ways. Check out this flashback—one of the most popular Diigo bookmark posts to date… Five super cool resources that can be used to locate and/or enhance images for educational purposes. Check ’em out below! Totally free stock photos for educational, commercial and/or personal use. No attribution needed! A treasure trove of royalty-free images for use in all types of multimedia projects and classroom activities. High quality free clip art for use on all types of educational projects. Resize, shrink, and crop pictures online for free before posting them to a blog, web page or social media site. Easily remove image backgrounds and/or create masks, cutouts and clipping paths with this quick and simple online tool. What do you get when you combine sticky notes with Google Slides? 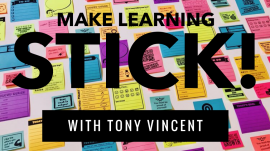 A super cool idea from Tony Vincent that shows teachers how to create customized messages for all kinds of classroom uses: Personalized notes, reminders, to do lists, paper tweets, exit tickets, motivational remarks and more! There’s even a wicked awesome template for generating sticky notes containing customized avatars using the Bitmoji Chrome extension. Get the scoop, including step-by-step instructions, design tips and templates, by visiting the Learning in Hand blog right here, right now! In the meantime, check out this instructional video demonstrating how educators can make this concept happen! Twitter: Way to collect feedback from students regarding a lesson, project, discussion, etc. 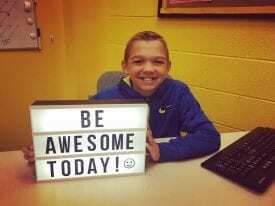 #OneSmallThing: Another teacher (Mr. Trexler) and I are promoting this concept in my District (which reinforces the importance of being kind) so we are planning to use this sticky note in our Media Center Kindness Challenge as a way for students to share how they have demonstrated kindness to others. 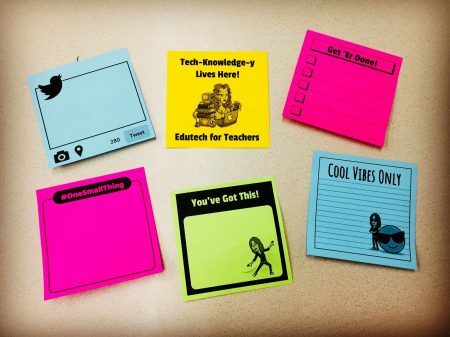 As simple as they are, sticky notes are powerful educational tools that can motivate and inspire students before, during and after all sorts of classroom activities that span the K-12 curriculum. Use the resources found within the Learning in Hand blog post to create personalized learning experiences for your students. A high five to Tony for giving me the thumbs up to highlight his innovative idea on my space! Can You Spell with Flickr? Spoiler Alert: The tool shared in this post is highly addictive… Read at your own risk! In 2013 I shared a post regarding Spell with Flickr—a nifty web tool that generates a logo based on images of letters and numbers from flickr picture galleries. And due to the coolness factor, I’m bringing back tech-y almost five years later! 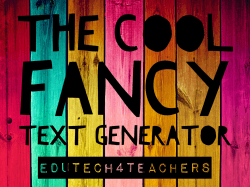 Although it’s not the new kid on the block, this text generator is a useful and super fun classroom tool that can be utilized to add some swag to your next digital or print project. Here’s how it works: Visit the Spell with Flickr web site, enter a phrase and within seconds, a pretty neat picture title of letters will be rendered. Don’t like the images that are returned? No problem—simply click on each individual image to swap it for another one. (This is the part that makes one psycho when using this tool!) Once you’re satisfied, copy the embed code to a web site, wiki and/or blog or drag and drop the letters to the desktop for later use. A screenshot can also be captured, edited and saved. 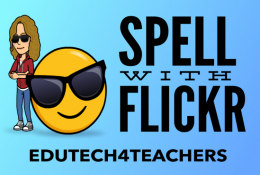 In addition to using Spell with Flickr for creating fun titles to enhance digital projects, presentations, reports, poems and more, this tool can also be used to create a number of classroom items: Bulletin boards, signs, banners, posters and word walls to name a few. Spell with Flickr could also be utilized to practice spelling words and/or to develop all types of books (i.e. alphabet, sight words, etc.). What’s new this week in my Diigo bookmarks? 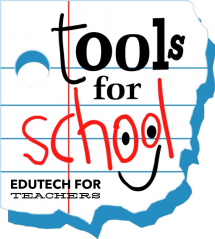 Check out the links shown below to access two super cool and very useful tools can be utilized to engage students in the classroom! A video editor app for iOS devices that contains filters, graphics, emojis, music and more! Use it to create multimedia projects, video feedback, short instructions for flipped learning and whatever else your imagination can create! Looking for a super cool and useful spring-time activity to utilize in your classroom? 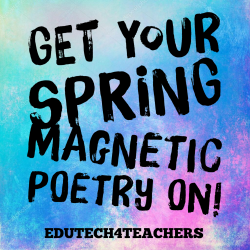 Then all you gotta do is snag a copy of my Spring Magnetic Poetry template! This Google Slides resource contains 75+ words and phrases that can be manipulated into a fun-filled poem, story, etc. for you and your students. As with my other creations, the word boxes are actually images and cannot be edited; however, they can be deleted. Plus, additional words can be generated by creating a new text box and filling it with a white background. » The background on the Google Slide is locked so students can avoid accidentally moving it. However, it can still be changed if you wish to allow them to do so. Just right-click on the slide and select the “Change background…” option. » Some teachers have requested that I provide a word list for each activity so I have created additional slides that includes this info. Check out a sneak preview below! Click here to access the template. You will be prompted to download your very own copy of the original to save to your Google Drive. It can then be shared with your students in a variety of ways—with Google Classroom being the easiest and slickest. 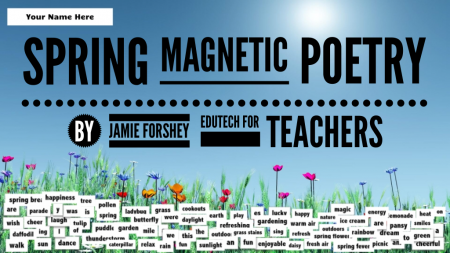 The Spring Magnetic Poetry template can be utilized as an independent or collaborative writing activity. Utilize the “magnets” included and/or add your own text boxes to extend the activity—although I think part of the fun/challenge is to just use the words provided. Have fun… And be sure to share your own classroom creations with us! 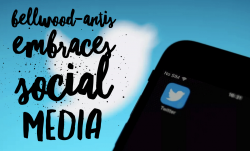 If you hear a lot of tweeting going on around the Bellwood-Antis School District campus, it’s not the birds of spring—it’s the Blue Devil Nation Twitter Challenge. Jamie Forshey, director of instructional technology and media, said she got the idea for the challenge from the Pennsylvania Education Technology Expo Conference in Hershey. Forshey said Twitter is a valuable tool that teachers can use to find ideas. “It is a great way for teachers to connect with educators in their field of study. Social media creates fear in some teachers. They are not sure what it entails, so they don’t use these tools. It is a valuable tool to add to their tool belt. Teachers have really embraced it,” Forshey said. The challenge attracted a larger group than expected. “My goal was to have 30 educators. I thought even if we had only five for the challenge, it would be pretty amazing. We have 55 educators from our district and seven others who learned about it on Twitter and wanted to be part of our group,” Forshey said. Most of the participants were not familiar with Twitter, Forshey said. “This is all about how to use Twitter for professional learning. A few individuals were familiar with it. For most of the educators, this is brand new for them,” Forshey said. Mirror photo by Walt Frank Ali Stinson (left), a high school math teacher, and Jamie Forshey, director of instructional technology and media, look over a digital flyer that contains information about the Blue Devil National Twitter Challenge. The challenge is comprised of two parts. In a nutshell, the participants learn how to use all 16 features of Twitter. Then they take what they have learned and use it in the classroom. Superintendent Thomas McInroy is among the participants. Teachers who are participating are enjoying the program. “I found some good ideas I would like to incorporate into my classes. I am excited. I keep finding new stuff every night. It will help my students. It is learning in a different way. You get a different perspective on things,” said Ali Stinson, a high school math teacher. Susan Bouslough, a third-grade elementary teacher, admitted she didn’t know much about Twitter. “I have become connected to other educators from within this school district and around the world. There are a lot of talented teachers in our district, and if you are not teaching in the same building, you don’t always get to interact and collaborate. “Through this challenge, I am able to see what is going on in other teachers’ classrooms. It motivates me to become better at what I do. I follow others with the same teaching philosophies, but I am also able to see ideas that challenge my thinking as well, and help me to grow as a teacher,” Bouslough said. Bouslough has started using an app called “Flipgrid” in her classroom. “Students can use video responses to posed questions. It is a short video, but it allows all students to have a voice. It provides a different way to assess students’ thinking as they explain their answers rather than through paper and pencil tests where they might just answer the question. “Students are also able to interact with each other through this app as well. I’m still learning and experimenting with ways to use this in my classroom, but my students love it,” Bouslough said. Teachers are always looking for new ways to reach students and improve their own teaching, said Matthew Elder, a high school social studies teacher. “That is what was at the heart of my decision to participate. When I had been student teaching a few years ago, the ‘take’ on social media was to avoid it at all costs. Education in the past five years has been changing so rapidly that social media is now beginning to be looked at as another tool and not something to be afraid of. There’s a wealth of information out there just waiting to be tapped into. When Jamie proposed the Twitter challenge, I immediately saw the opportunity to both improve my own teaching by connecting with other educators across the world, as well as an opportunity to reach my students in a more effective way,” Elder said. Elder said the challenge has been beneficial to him as a new teacher in the district. “It has helped me connect with teachers across the district that I don’t work with directly and see on a daily basis, so that has been amazing, too,” Elder said. Forshey is pleased with how the challenge is going. “I am impressed with the activities that are going on in our classrooms as a result of finding information on Twitter. Educational technology has exploded. Some teachers are on fire taking in this information. They have learned and are implementing it in their classrooms,” Forshey said. Those who complete the challenge will earn a 10:30 a.m. early dismissal on May 25, a professional learning day. “That is the reward we presented to get them to buy into the challenge. Many are finding the reward is the information they have learned and to share information with educators,” Forshey said. For more information about the Blue Devil Nation Twitter Challenge, check out the official site here. This article, written by journalist Walt Frank, appeared in the Altoona Mirror on March 22, 2018. The original version can be found here. What’s new this week in my Diigo bookmarks? Check out the links shown below for a variety of 3D resources that will bring learning alive in your classroom! An iOS, Android and Windows app that provides users in Grades 3-12 with a 3D coding platform for building programming skills as well as the understanding of basic algorithms. Teachers can create game levels and share them with students via a QR code. Build virtual 3D LEGO® models online. No plug-in, no installation required. Everything happens in your browser wherever you go! Build your own project and/or browse the bank of existing projects. Great for creating objects for lessons! The world’s largest network of museums has introduced a web portal to create 3D renderings of its vast and fascinating collections of more than 137 million objects. Explore these treasures in your classroom like never before! An iOS and Android app that can be used to learn, teach and explore different types of 3D solids and to help students explore and understand geometry in a convenient and easy way.